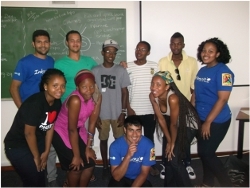 A youth-based educational organisation at UCT, Inkanyezi, has seen a positive leap in 2013, although it says it requires more support from the community in order to fulfil its goals. 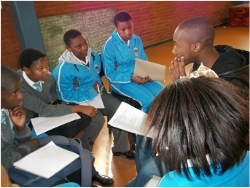 Since 2012, Inkanyezi has expanded its reach from one school to three. Currently, the project works with high school children in Khayelitsha, Philippi and other underprivileged areas where youths are struggling to pursue their educational aspirations. “Basically, we are trying to bridge the gap between high school and university for these children,” said Marketing and Events Manager, Kukhanya Ncube. Ncube said that despite Inkanyezi’s growth over the last couple of months, the organisation still lacked the status, sponsorships and volunteer base of goodwill giant, SHAWCO. “We are appealing to the student body for support in this regard,” Ncube said. Inkanyezi is one of three sub-divisions of Ubunye, an umbrella organisation based at UCT, alongside the Township Debating League and TeachOut. The organisation provides students with the necessary means to take advantage of the tertiary education opportunities available in their communities and beyond. -and mentoring in academic and lifestyle programmes. Lindokuhle Mahlangu, a former student at Intsebeziswano High School in Phillipi, said she was very grateful for Inkanyezi’s mentorship during her time in grade 11 and 12. “Thanks to Inkanyezi, I now have an opportunity, which I am grabbing with both hands,” Mahlangu said. Mzoxolo Sitoto, an Inkanyezi volunteer, used to be a pupil at one of the schools the organization volunteers at. “What made me join the project is that I wanted to do the same thing as the volunteers were doing, and it was all about giving back to my community,” Sitoto said. Sitoto, who descibes Inkanyezi’s team of volunteers as “agents of change,” said he urges the UCT community to help the organisation with its primary challenge, which is to change the attitudes and mindsets of the students it helps. If you would like to get involved with Inkanyezi, visit www.inkanyeziletusshine.co.za or email their Marketing and Events Manager at [email protected].